Golden Country Zipang, was leading gold producing country in the world, and it was enough to produce one-third of the world's gold before. We aggressively take M&A strategy promising mine (mining area) of the world, all of the exploration, mining, mineral processing, refining and sales business, which is the full covered for the mining business in the international resources major strategy, it aims to revive the Golden Country Zipang. JIZO mine is open-pit gold mine located in Otani village, Kitaazumi-gun, Nagano-Pref. The area is a famous place in Itoigawa-Shizuoka Tectonic Line, “Fossa Magna”, that bisects the east and west of Japan's crust, there is a point of the JIZO Mine, southeast direction 20km from the “Itoigawa station” of Hokuriku super express. Estimated gold reserves of JIZO Mine gold content average is about 30g/ton. It’s the high-grade gold mine. The exploration research more than 10 years, we are confirmed that the high-quality gold vein is present there. Then we are received The Mining Rights in 2013 and received The Permission of Operation Plans in 2014. We have been operating full-scale business development now. We sell gold coins of King Miders Digital Gold. If you wish to purchase, please apply from the following major Internet shops or click here. We will ship it in JIZO Mining original case. ※ Please note that gold coin designs may be changed without notice. It is a motif of Midars King's portrait, which is famous for the Aesop story, which turns all touching things into gold. King Midars is also a famous king even "King's ear is a donkey's ear". 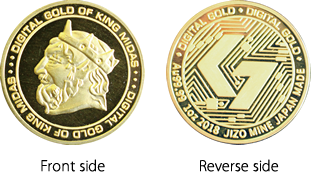 The outer ring part is stamped as "DIGITAL GOLD OF KING MIDAS". As the image of "DIGITAL GOLD", we designed gold initial letter G in the center of the wiring base pattern of the IC chip. On the outer ring part, "DIGITAL GOLD" on the top and both sides, “Au 99.99, 1 oz,., 2018 Jizo mine, Japan made” on the bottom left. 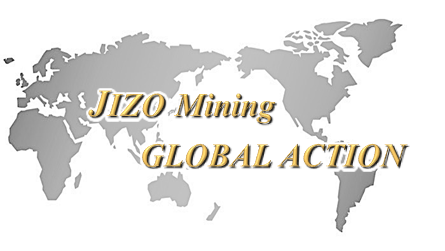 JIZO Mining Co., Ltd.｜Copyright © JIZO Mining Co.,Ltd. ALL Right Reserved.